Mahindra Racing’s rookie recruit Andrea Migno produced a fantastic ride to take eighth position in only his second World Championship race of the year on Sunday, at the Gran Premio TIM di San Marino e della Riviera di Rimini. Teenager Migno, a graduate from Valentino Rossi’s VR46 Riders Academy, came through from 22nd on the grid to join the cream of the Moto3™ class, not only holding his own in a big gang battling for seventh place – including three current GP winners – but working his way to the front of it. The 18 year-old lost seventh place only on the last lap, finishing second in a group of five riders. Migno lives just five kilometres from the Misano circuit, but has very little previous circuit experience, having come to prominence racing in the FIM CEV Repsol series. He joined Mahindra at the previous round in Silverstone, taking the place of Australian rider Arthur Sissis for the remainder of the 2014 season. Migno also rode at Catalunya and Brno last year and he will now look to further build up his experience over the forthcoming five rounds, which will complete the current campaign. 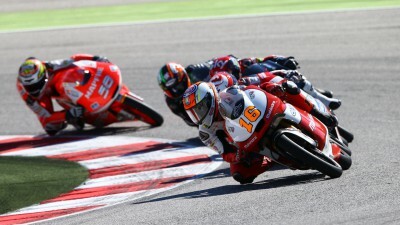 Migno’s positive result lifted the spirits for Mahindra Racing after his teammate Miguel Oliveira crashed out of third place, missing out on a good chance for a second podium of the season.